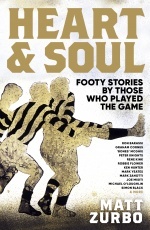 Not many football identities can lay claim to the beloved stature enjoyed by Greg Champion without lacing up the boots or stepping into the commentary booth, but the Coodabeens’ star has spent decades delighting fans with the songs that comprise The Thing About Football: The Songs of Greg Champion. Since his Coodabeens’ debut in 1983, ‘Champs’ has written thousands of football and cricket-themed songs that have become part of the Australian sporting vernacular, and for the first time their lyrics are collected in one place. 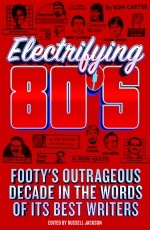 From Dermott Brereton is a Hood and I Am Diperdomenico to There’s Only One Tony Lockett and Tony Modra’s Gone Surfing, Champion’s ditties and parodies have become favourite singalongs, harking back to simpler times when a lukewarm pie and a tattered beanie were all that footy fans needed for a day in the outer. After 36 years on the ABC airwaves, Champs has also toured the country constantly since he first came to national prominence with his 1986 single, I made a hundred in the backyard at Mum’s. 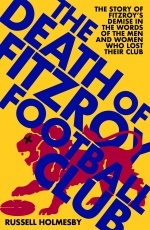 In 1995, the Seven Network adopted his fan favourite, That’s the thing about football, as its theme tune for AFL broadcasts, and the song became became ubiquitous.